The old saying goes…”See a penny, pick it up, all day long, you’ll have good luck.” So even though pennies aren’t worth much these days, they are still lucky. 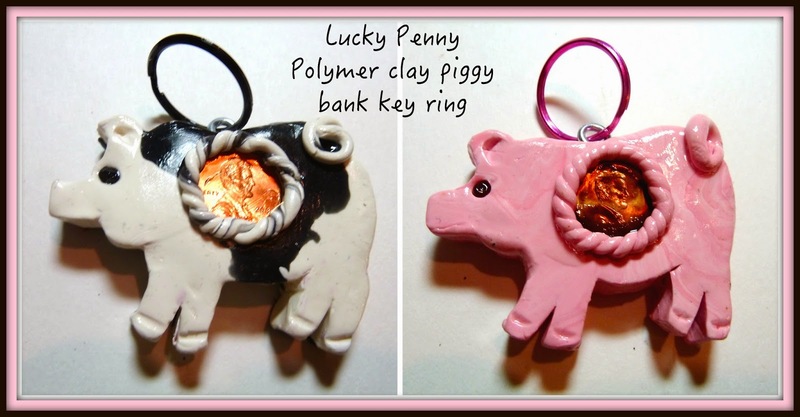 Keep a lucky penny from a birth year, anniversary, wedding or just a shiny new one with you all the time on a piggy bank key chain easily created with some polymer clay. 2. Use the clay roller to roll out the clay to a ¼” thickness. Download and cut out the pig pattern. Place the pattern on top of the rolled out clay and carefully cut around the shape with the cutting tool or a craft knife. Smooth the edges with your fingers or the smoothing clay tool. 3. Use the pointed tool to punch two holes for the nose and indent a bit at the ears and hooves. 4. Place the penny in the center of the pig and trace around with the pointed tool. Carefully dig out this center till the penny can fit in it flush. Roll out two skinny snakes and twist together. Place around the penny in the pig and press to adhere. Adjust the shape if necessary. Roll another small snake and taper it at one end. Attach it to the rear bringing up the tapered end into a curl. 5. Use the pointed tool to push a black seed bead where the eye should be. Make a hole in the top center of the pig for attaching the eye screw. 6. Place on a foil-covered pan in a 275-degree oven for 15 minutes. Do not bake at a higher temperature or longer than recommended. 7. When cool brush on some acrylic gloss sealer for clay and let dry. After one side dries brush on some gloss sealer on the other side. Attach the eye screw using a bit of E6000 glue on the end and add the key ring. Wickedly adorable! Loving this idea. Kudos to you.